Even after a restful night’s sleep you can wake with red, puffy eyes that make you look and feel tired –especially during allergy season. If decongestants leave you in a fog, try THERA°PEARL’s Eye-ssential Eye Mask, the natural way to look and feel brighter every day. 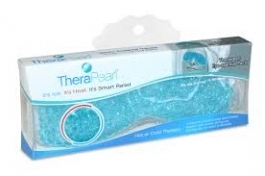 TheraPearl Eye Mask should be applied to skin or closed eyelids. Use for no more than the doctor recommended time of twenty minutes. Easy to care for. Gently clean Eye Mask with mild soap after each use. Cold Therapy Freeze for at least 2 hours. Microwave for time indicated below and test Eye Mask temperature before use. Heat for additional 5 seconds as needed until desired temperature is reached.